I hope your Protected content off to a good start! 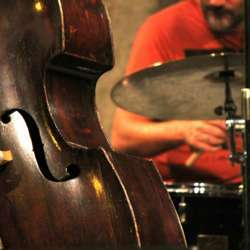 I'm sure you're tired of all the partying ;) So I suggest: let's get together in the cozy atmosphere of the Protected content and enjoy some (free) jazz! We can go inside at 20:30, music starts at 21:00. But since I'm not sure how full it will be, let's meet around 20:15 already so we don't end up at the end of the line (if there is one). They have some snacks like pretzels in the bar, but since it's the uni campus, there are plenty of cheap food places around if you need to grab some dinner.